There’s nothing quite like watching your guests’ jaws drop when they are greeted by a string ensemble that’s dramatic and luxurious sounding. And of course, that’s to say nothing of the strong and polished visual statement they make. But what’s the correct approach to planning strings for your day? And how many do you need? Come to think of it: can they play a Jay-Z String Cover just as easily as Here Comes the Bride? By adding a second player, we can now introduce the accompaniment part to provide a fuller sound than one-stringed instrument alone. As a rule of thumb, the more musicians, the more the song-repertoire expands. A third instrument now introduces harmony to the melody and accompaniment. Trios can cover most standard repertoires including classical ceremony music and versions of popular songs. 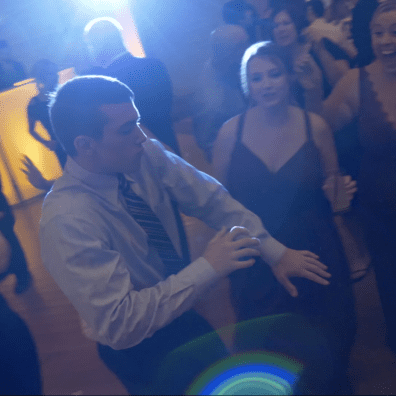 If you want Cannon in D as you’re walking down the aisle or Ode to Joy as your guests arrive but Guns N’ Roses and Justin Timberlake covers at the cocktail hour, a Trio is the way to go! Adding a second violin to a trio really rounds out the sound, providing more overall dimension and richness (as there are multiple harmonies). In addition to performing classical ceremony music and popular songs, this grouping can cover classical music specifically arranged and written for a quartet. And yes: they can do Jay-Z too. Whether you’re considering strings for your wedding or even a corporate event, there’s no better way to make a statement and set an upscale and refined classic tone. 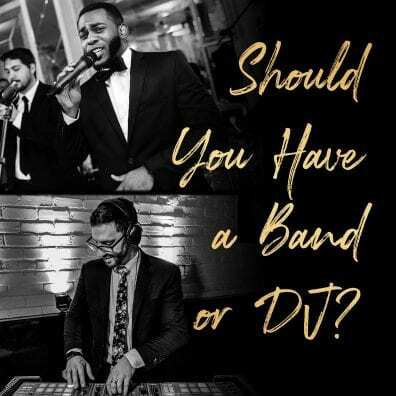 Should You Have a Band or DJ? Give us a call at 201.768.7711 or click the button below! FOLLOW US FOR TIPS AND GREAT ADVICE FOR BRIDES!